This is the opening novel in the Heechee saga; several sequels followed. 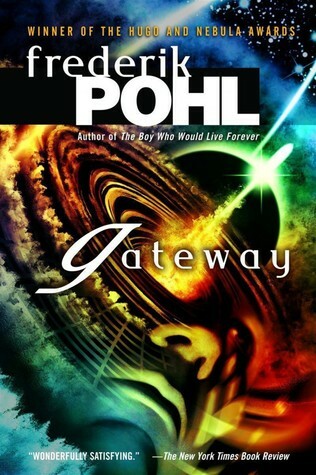 Gateway won the 1978 Hugo Award for Best Novel, the 1978 Locus Award for Best Novel, the 1977 Nebula Award for Best Novel, and the 1978 John W. Campbell Memorial Award for Best Science Fiction Novel. The novel was adapted into a computer game in 1992. How it got these awards, why ? I don’t know. It’s not a good novel. Half of the story is of the main protagonist whining to a robot psychiatrist , which isn’t interesting. The other half is of his journey to Gateway. It didn’t get far as I stopped after a quarter of the way through. It became boring, endless conversations and comments. The premise was interesting, but nothing happens to draw the reader along in the story. Another example of ‘award’ winning novels lacking a decent plot. This was read as part of the Sword and Laser book of the month read.